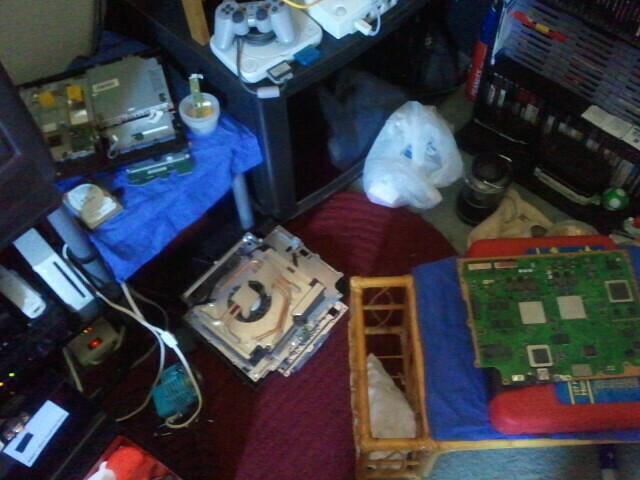 So, what does the inside of a PlayStation 3 look like? Here are some pictures I took last summer of what the inside of my 2007 “Cadillac” 60GB (now 500GB) launch model of my now old & non-working PS3 looks like (it was way out of warranty anyway). From left to right is the top case with media drives and power source, the cooling fan and heat-sink, and the main motherboard. Check out the whole wild, wild (well, maybe not THAT wild) and crazy story and a slideshow after the break. I’m referring to my old PS3 as the “Cadillac” model because this version of the PS3 had full-backward compatibility with PS2 games, multiple memory card slots, and chrome finishing. I had to exhaustively research and perform the task of reflowing the CPU and GPU of the system to repair the “yellow light of death” (or “YLOD”) hardware failure problem, which actually effects a small percentage of PS3s. I actually had to do it again after the YLOD problem returned, just before I purchased my current replacement PS3, and managed to perform a data backup from the old PS3 (mounted over several ice packs to keep it cool) to an external hard drive, then install the old 500GB HDD from the old PS3 into the new PS3, then a data recovery to the old PS3, and finally a full data transfer from the old PS3 to the new PS3. Thankfully, all data from old PS3 was transferred to new PS3 without issue, and right after I performed a complete data wipe on the old PS3, it DIED AGAIN. I’d love to thank Boomont, Ace_J66 & Gilksy (gilksy1@btinternet.com) for the very, very, VERY helpful PDF guide. You’ll want to use the PS3’s “Data Transfer” utility on BOTH the old PS3 and the new PS3, and all you need is an ethernet cable. Here’s the link to the official guide and instructions from Sony.